Julie Henigan DADGAD and DGDGCD Tunings PDF download. DADGAD and DGDGCD is an extension and expansion of the previously released book, DADGAD Tuning. It includes a number of additional instrumental solos in DADGAD for beginning-intermediate guitar players, while introducing DGDGCD, a related open tuning. More traditional Irish and original Tunes and songs arranged for fingerstyle guitar. Although many of the selections are traditional Irish dance tunes, the book also includes an American dance tune, two traditional Irish songs, and original instrumentals by Frederick Boyce, Jake Schumacher, Gilles le Bigot, and the author. The book is written in tablature and standard notation. 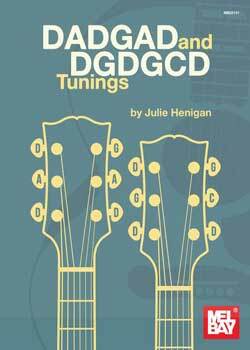 Download Julie Henigan – DADGAD and DGDGCD Tunings PDF free and other books from our site. Only high quality PDF scans. Please write a review, it's important for our community.